The July 2014 Gaza war killed over 2,000 Palestinians, 70 Israelis and caused an immense level of devastation in Gaza. Tens of thousands of homes were destroyed or damaged by Israeli airstrikes and shelling, in response to missiles fired towards Israel by Hamas militants. The issue of importing concrete into the besieged strip is now the newest battleground between the people of Gaza and Israel. "I'm getting really scared at night, I don't sleep. I'm worried that the house will collapse," says Fida Mosabeh, 32. It has been two years since Ms Mosabeh and her family fled their home in the middle of the night as Israeli warplanes pounded their neighbourhood on the outskirts of Gaza. They returned to find half their house. It had been hit by a missile strike and left severely damaged. Two years on from the war, they are one of the thousands of Gazan families still waiting for their homes to be rebuilt. 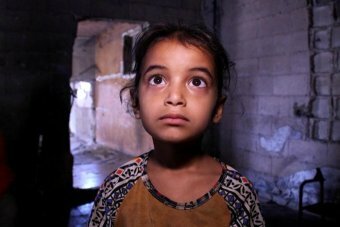 Ms Mosabeh walked the ABC through the blackened, burnt-out rooms she and her husband and two children have now spent months living in as they wait to repair their home. There is no electricity or running water and one whole side of the house is blown away and open to the elements. As her nine-year-old son Mohammad and six-year-old daughter Rula play in the ruins, the memory of their old life becomes too much for Ms Mosabeh to bear. "If it was only for me, I can survive, but what about the kids?" she says, sobbing. "I beg you for the sake of my kids, I just want to live a normal life. I don't feel like I'm living, at all." The problem is Israel decided to just not deal with hamas after letting Palestine have a free election. It is almost like you have choice but you are only allowed to choose the way we want. It was mostly Bush’s fault but Israel should have never been involved in the election of another state.